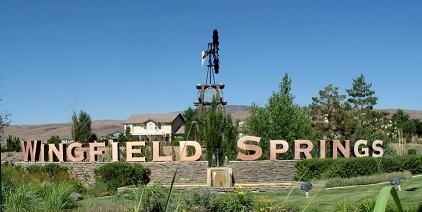 is located in the northeastern part of Sparks, Nevada and is a newer community which continues to expand. It is also the home of the Red Hawk Golf and Resort community which has two well maintained 18 hole courses, club house, driving range, and restaurant. The course is currently owned and operated by the Peppermill Casino. There are many homes and condos located adjacent to the courses. This is a great location for a retirement home or vacation home, as well as, primary residences. This community is within a few minutes drive of downtown Reno, the Reno Tahoe International Airport, and Lake Tahoe and all of its amenities. Another great feature to living in Wingfield Springs is the sports complex at the Golden Eagle Regional Park. This sports complex has several fields for sporting events like softball leagues and soccer leagues. These homes are located north and east of the Red Hawk Resort and are also newer homes.